This Tespia round is going to be about Big Bang. 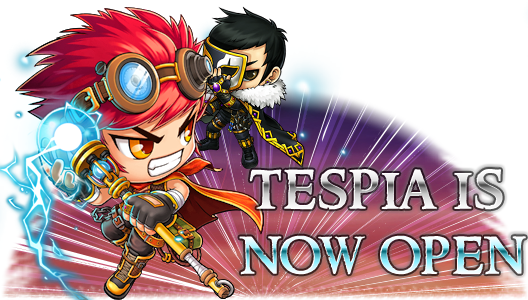 Which is if you've seen some of my videos in the past couple months is about a complete change in MapleStory. Changes ranging from exp curve, new skills, job balancing, map changes, new monster levels, etc. Also, one of the reasons why I have not updated my meso guide or training guides is because I want to wait for the Big Bang Patch to come first. Since Big Bang is going change practically everything, I wouldn't want to rewrite the entire guides over again. So instead I want to write a whole new training/meso guide that is based off the new patch. I am currently in the process of moving back and forth from my college room and my room back home. So I don't always have my desktop with me; which is what I use to record and edit my videos. Bare with me though if I upload a new video and its either laggy or in bad quality. That just means I recorded it from my laptop and not my desktop. Hi Alisun... What world do u play in? Can we meet up sometome in maplestory? Hi. I just want to thank you for posting so many videos about big bang ^_^. They're very helpful and helping me prepare for big bang.